I love cooking at Christmastime, but the rush of the holidays sure does make it hard to carve out large amounts of time to really get focused. Still, whenever I do have the time, I enjoy it so much. We have a pretty standard menu for Christmas Eve (our fancy meal) and Christmas supper (more casual), but we do like to change it up a little. This year, I am trying to cook our meals from local foods that are available at this time of year or that I froze/canned this summer. Here is what we’re having! What about you? 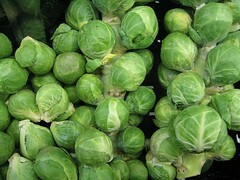 What are your favorite holiday foods? Do you have a traditional menu or do you experiment each year? We’ve been talking about the need to add a “breakfast for dinner” night to our menu and I found a way to make a pancake supper that also celebrated winter (although it’s still in the 60s here) and Christmas. Enter, the reindeer pancake. I saw this idea online somewhere and couldn’t wait to try it. The version I saw used candy for the eyes and nose, but I subbed out some of our frozen fruit instead. So easy, so cute and it put everyone in a cheery mood at the table–given the news this past week, that was really needed. Line a rimmed baking sheet with paper towels or a tea towel. Sit a wire cooling rack on top of the towel and put in the oven. In a frying pan, cook bacon until crisp. As bacon is done, lay strips on the cooling rack in the oven to keep warm. This will keep your bacon crispy yet let it drain as well. Clean the pan, coat with a thin layer of butter or cooking spray and heat over medium/low heat. Make one 8-9″ pancake per person and one 3-4″ pancake per person, plus extra for eating later. As pancakes cook, add them to the cooling rack in the oven to keep warm. When ready to serve, arrange a big pancake on the plate, with a smaller pancake (to be the muzzle of the reindeer) on top and toward the bottom of the larger pancake. 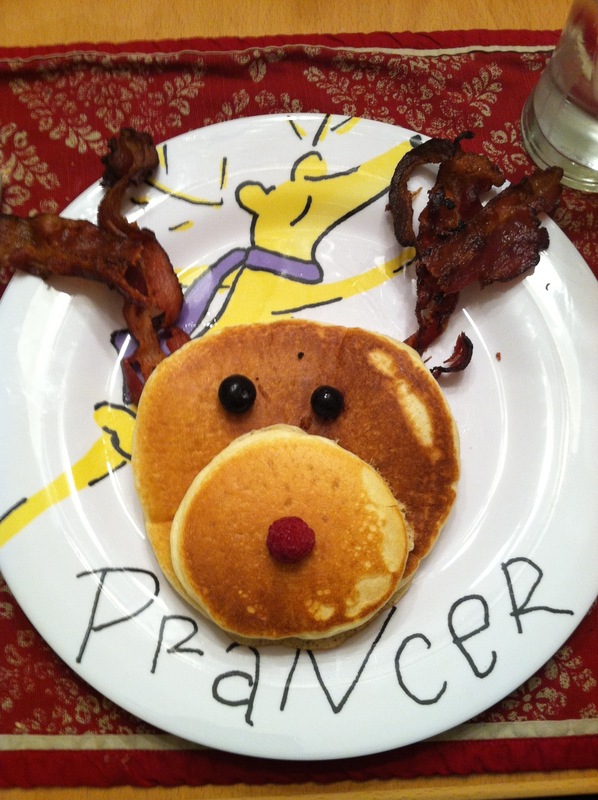 Arrange bacon antlers on either side of the large pancake. Add blueberry eyes and raspberry/strawberry nose. Serve immediately with warm maple syrup and plenty of good cheer!